as wet as I expected. The manufacturer has injected some kind of miracle webbing into the cushion that didn’t release its inner core of wet until I’d sat on one for some time. Then I turned it over and water dripped out. Me – dry; inner core - dripping. Also this is great because now I have something new to obsess over, namely, how evenly the cushions are drying. 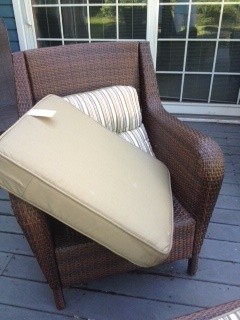 After a rainstorm, I can periodically, every hour or two, or every fifteen minutes - or every five, if I’m stuck for other more wholesome activities - go outside and rotate the cushions. Because that’s the kind of person I am. I haven’t felt this good about stuffed anything since I used to sit on my transitional object (Bunny) to press her face the right way. It was flat, and I wanted it to puff out. Of course. Never happy with what we have, are we? But, hey, bunnies’ faces puff out. They are not flat. 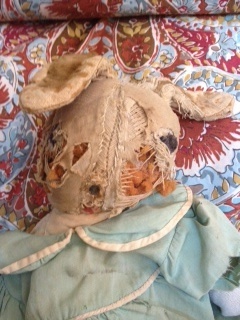 I wanted my bunny’s face to be like a real bunny’s and puff out. Which it did, if I sat on Bunny just the right way. So that gave me something to do. And do. And do. And do. Yes, this is Bunny. She is my bunny. Is it any wonder my nursery school teacher recommended me for a little play therapy at 3? And clearly, it worked. Because. Anyhoo, I was going to talk about something I read in The New York Times that maybe you read, too, Readers. I'm referring to that article about the guitarist Jason Everman, who was fired from Nirvana just before they hit it big, and then after touring with them for a year, got fired from Soundgarden just before they became massive, and then he joined the Army and eventually became a Special Forces soldier? After such public failures, then the guy goes off and does something that is highly specialized and secret and is kind of like joining a secret society because when you’re in Special Forces no one can know exactly what you do. Even after you’ve done it, you’re not supposed to talk about it, but those who are in the know - those who are in the band - know how very cool what you do and did is. There’s a lesson here about success not lasting or not being meaningful if it’s not based on something you value. And I guess, also, his story is a parable of how fame and fortune don’t mean much, if you don’t love what you do. And Jason Everman didn’t love the rock life. He was, according to this article, an excellent musician, so he wasn’t fired for lack of talent. Ironically, he got fired both times because he didn’t gel with the band. He didn’t play with the team. I say this is ironic because what I know about the military is that it’s all about team effort. And I know a lot about the military. I saw “Private Benjamin.” By the way, “Saving Private Ryan,” was the last war movie I ever watched and I blame it for causing the umbilical cord to wrap tightly three times around my first child’s neck which led to a c-section. I one hundred percent believe that she was trying to escape the terrible noise in the movie theater and got herself tangled. My belly was lumping up and down like boiling water during that thing. But I digress. My point is that although Jason Everman didn't want to be in a band, he did want to be in a band of a different kind. So he just kept trying to find the right kind. And he did. By the way, I think it’s cool that Jason Everman’s name is almost EverYman, which adds a further parable-like element to his story. Everyman's search. But also maybe there’s another lesson for me and people like me in his story. That lesson is that you can leave behind public humiliation and what looks like terrible failure. This is pertinent for me because, as I may have hinted or mentioned here and there, I’m circling around a book proposal. And I’m hesitant to write about it here. As I told the husband last night, I had nothing to blog about, because I wasn’t about to blog about writing a book, and he said, Well isn’t that what this whole thing is about? By "this whole thing" he meant my blog, but we can excuse his unclear antecedent, can we not? And I said, What if I fail to sell my proposal and fail to publish my book after broadcasting that I’m trying to on my blog? On my blog about success. And the husband, the ratfink, said I really should write about it, because after all isn’t that the crux of the question? After which I told him it was time for his Vitamin D pills, so that while he was swallowing them he would stop challenging me. Still, he made me think. I mean, have I blogged for the past two years about all the elements of success and wound up in the same spot I started, with the assumption that Everyone (my Readers and me) will consider me a failure until I succeed? Or have I learned that success is also a byproduct of enjoying the process of working toward a goal? Well. What do you think, Readers? write the best book you can. let chips fall where they may. i'll read it! I read something - maybe in your blog? (can't remember sh#t!) - that Nora Ephron said after a movie of hers flopped. Basically she said, Yeah, but I had the privilege of engaging in a creative process for two years, so I can live with that. Maybe that's easier to say when you've already had a string of hits, but it has still helped me. I now frequently remind myself how privileged I am to do what I love every day: read and write. Recognition is energizing...the responses I get from my blog are steady little "atta girl"s that keep me bobbing along happily. Thank you for the reminder, Kathryn! And yes, it was in my blog - so I do have some tips to teach myself. You are so right. No reason not to try. I am lucky indeed to have to opportunity.